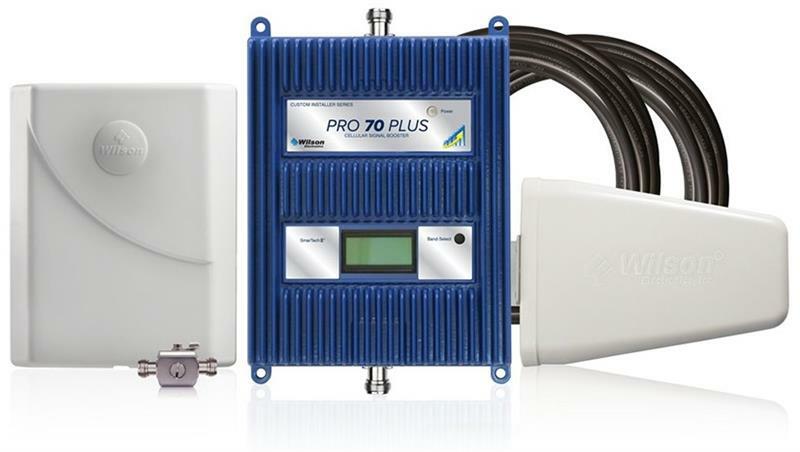 Designed to provide maximum coverage for luxury homes, large commercial retail or any other application needing better cell signal, the Pro 70 signal booster significantly amplifies cellular signals for all carriers with up to 70 dB of gain. The Pro 70 from Wilson Electronics amplifies weak cellular signals to provide reliable voice and data coverage - including 4G - inside homes and other buildings where signals may not penetrate. The Pro 70 Plus features a self-optimizing microprocessor with a built-in graphical signal meter. The uplink and downlink power display makes it easy for the integrator to determine the direction of the cell tower and the strength of the available signal, which greatly reduce installation time. Like all Wilson boosters, the Pro 70 features cell site protections that prevent any possibility of interference with cell towers. The Pro 70 Plus, and all CI models from Wilson Electronics, are sold only to custom technology integrators and are not available through any online or retail source. Wilson Electronics quality and an industry-leading three year warranty make the Pro 70 the clear choice for the professional technology integrator. High gain, directional Wide/Multi band cell phone antenna - for 700MHz LTE, 800/850MHz Cellular and 1900MHz PCS, 1700/2100 AWS, 800/900MHz iDEN/Nextel/SMR, Euro/Asian standard 900MHz and 1800MHz, WCDMA 2.1GHz and the 2.5GHz WiFi band. Protects amplifier from surges resulting from outside antenna being struck by lightning. Includes Ground Wire, Coax jumper and three different types of grounding devices. Dual-band weather proof panel antenna for use as exterior antenna in Amplifier/Repeater/BDA Systems.